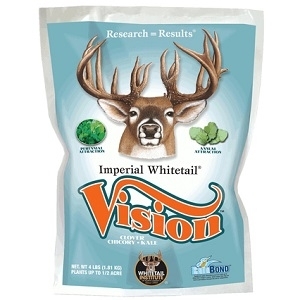 Imperial Whitetail Vision (Perennial) 4 lb. Imperial Whitetail Vision is a fall planted perennial that features the number-one food-plot planting in the world, plus the attraction and drought resistance of WINA-100 perennial forage chicory, and the increased early and late season tonnage and exceptional attractiveness of 210K annual forage kale. The Imperial Whitetail Clover component contains the Whitetail Institute’s newest proprietary clovers, which bring the same year-around attraction and protein content to Vision. WINA-100 chicory and 210K kale boost early tonnage, and they increase attraction by offering deer a variety of exceptionally attractive food options within the same food plot. WINA-100 chicory also increases the drought resistance of the product even further. The Imperial Whitetail Clover and Whitetail Institute chicory components of Vision continue to provide abundant protein year-round for antler growth and overall herd health for up to five years after planting.